The Instron 5984 30k UTM is a PC-based load and displacement controlled electromechanical testing machine. The state-of-the art control platform Bluehill 3 allows the operator to define, program, and perform both standardized (e.g. ASTM, ANSI, etc.) as well as novel tests. The versatile program environment is tailored to support databasing and auto-reporting of simple as well as highly complex, repetitive testing campaigns. 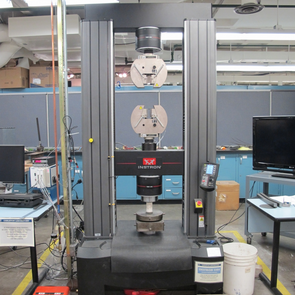 The machine is capable of both tension and compression loading and is equipped with two testing bays. The bay above the moving crosshead is equipped with automatic pneumatic tension grips, tailored to provide controlled, constant gripping pressures and ergonomics, especially in testing projects with a high sample count. The bay below the moving crosshead is equipped with a 6 in diameter spherical swivel compression platen.